As the Trump administration, California regulators, environmental groups and automakers fight over future fuel economy standards, one automaker is taking a distinctive approach to extracting more mpg from full-size pickup trucks. Fiat Chrysler Automobiles’ new 2019 Ram 1500 pickup gains mileage improvement with a mild hybrid system dubbed eTorque. It is unlike the current efforts by Ford and General Motors, which rely on diesels and turbocharged smaller engines. And also unlike both those brands, FCA makes eTorque standard on its least-expensive models. Trucks.com drove the pickup over hundreds of miles and found that it was at least a double-digit percentage improvement over previous models. Generally speaking, the eTorque system provides the most fuel efficiency gains the more one drives in urban traffic. The Environmental Protection Agency rates the 2019 Ram 1500 with the 3.6-liter V6 eTorque engine at 20 mpg in the city, 25 mpg on the highway and 22 mpg combined. Models equipped with 4×4 are rated at 19 mpg city, 24 mpg highway and 21 mpg combined. The 5.7-liter V8 is rated at 15 mpg city, 22 mph highway and 17 mpg combined while trucks with 4×4 lose 1 mpg on the highway. Equipped with eTorque, the V8 rating jumps to 17 mpg city, 23 mpg highway and 19 mpg combined with 4×4 models seeing a decrease of 1 mpg on the highway. Any 2019 Ram 1500 V6 comes standard with eTorque, and that includes the three least-expensive models, whether two-wheel drive or four-wheel drive. The system is optional on V8 — or Hemi — engines for a $1,450 premium. Given 2019’s complete redesign and added equipment, direct price comparisons are impossible, but the least-expensive 2019 is just $600 more than the closest 2018 version, which represents a relatively small bump for a potential 10 percent rise in fuel economy. 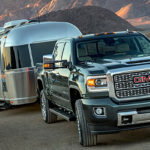 While lower-trim and mainstream models present considerable volume in pickups, new models always skew toward the luxury trim models and high priced versions. The V6 won’t reach Ram’s 25 percent-of-sales target for a year or two. It is essentially a robust auto start/stop system aimed more at drivability and efficiency than enhancing performance. The eTorque uses a 48-volt battery pack behind the left rear seat and belt starter-generator to switch off the gasoline engine when the vehicle isn’t moving and restart it as needed within a fraction of a second. When the gasoline engine is not running eTorque provides power so that functions like steering assist, ventilation fans and defrosters, wipers, audio and navigation systems remain active as normal. In brief instances it provides supplemental electrical propulsion, but it will not drive the vehicle on electricity alone. Depressing the brake pedal engages battery regeneration, down to 10 mph, at which point all retarding effort comes from the brakes. The system is completely automatic, unless you disable it with the switch adjacent to the gear lever. Under ideal conditions — say minimum climate control use in mild weather — eTorque will power the truck for up to 10 minutes. An eTorque-optioned Hemi offers the Ram 1500’s highest tow rating, 12,750 pounds, though eTorque does drop load-carrying capacity by 90 pounds. A standard 12-volt battery and electrical system eliminate any concern about accessorizing or jump-starting. While the eTorque does save money on gasoline, the upcharge to get the system in the V8 takes four to five years to recoup, depending on the final EPA ratings. Lacking official fuel economy estimates Trucks.com can still make some projections. They are based on 12,000 miles per year of combined driving, which the EPA splits as 55 percent city, 45 percent highway and the Energy Information Administration’s national average mid-grade gasoline price of $3.073 per gallon. If the EPA combined rating rises by 2 mpg from the standard V8’s 17 mpg, the cost to drive 100 miles drops from $21.69 to $19.41. That amounts to about $274 dollars in gas savings annually. If economy rises by 3 mpg, cost drops to $18.44 per 100 miles, or about $390 annually. This does not consider any potential benefits such as smoother performance, reduced emissions and noise, longer maintenance intervals or effect on resale value. Trucks.com drove both V6 and V8 eTorques, the latter including 150 miles of rolling interstate at 70 mph or better and another 150 miles across the infamous Tail of the Dragon leading to the Nantahala and Chattahoochee National Forests. These routes are all far from ideal for fuel economy. But the 22.9-mpg average in the V8 betters other Ram V8s, which carry an EPA rating of 15 for city driving and 22 on the highway. Many consider the greatest compliment to any new technology that it drives just the same, and the eTorque Ram approaches 100 percent in that litmus test. Most people won’t know it’s there or working unless they notice the icon. There is no “whine” as in most hybrid and electric cars. The automatic restart feels smoother in the V6, but even the V8 stop-restart will go unnoticed by most. To a calibrated foot the brake pedal feels slightly spongier than the standard Ram and may require the slightest adjustment crossing through 10 mph, but the average driver will find the system nearly transparent. Hybridizing will never make a pickup into a Prius, but the eTorque system does offer benefits with no compromise to the Ram’s ability to work. Editor’s note: Fuel economy figures were released following publication of this review and the article has been updated to reflect this information. Additionally, to facilitate this report, Trucks.com attended an event where Ram Trucks hosted travel and lodging.